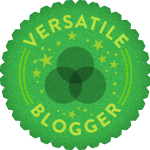 Anyone who has read this blog will easily be able to see how passionate I am about food, from cooking to eating out, and it has therefore been an ambition of mine for some time to eat at a restaurant with at least one Michelin star. 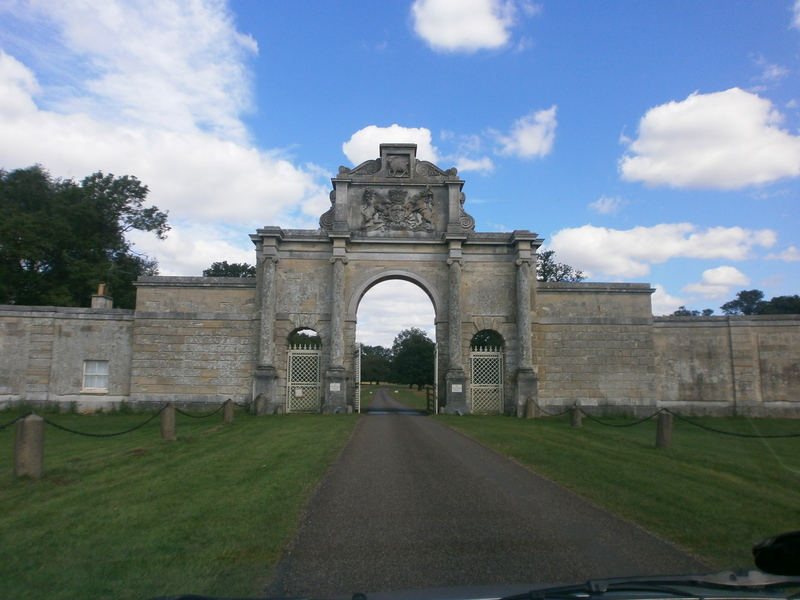 Unfortunately, Northampton does not have any restaurants with a Michelin star so I had to look a bit further afield which is when I came across The Paris House in Woburn, Bedfordshire. 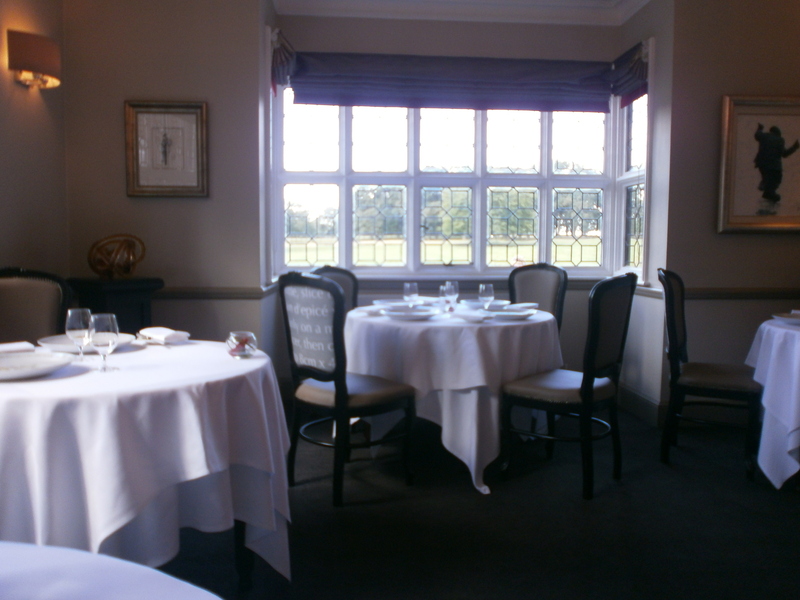 On it’s website, the restaurant describes itself as, “Bedfordshire’s only Michelin starred restaurant set in 22 acres of stunning deer park on the historic Woburn estate, the Paris House is an award-winning restaurant creating fine dining interpretations of classic dishes”. It sounded like the ideal treat so I immediately booked on-line for a Friday lunchtime at the end of August. The entrance to the restaurant is part of the estate walls and is truly impressive and inviting. The building itself was designed by Gilbert Redgrave and was originally built in 1878 in Paris. 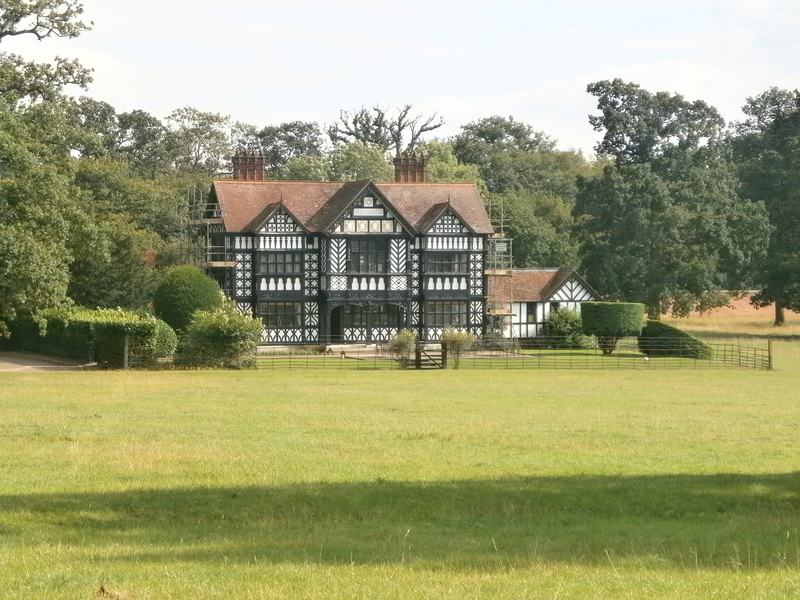 The 9th Duke of Bedford fell in love with the building and had it dismantled and shipped to England so that it could be rebuilt, timber by timber, in Woburn Park. The building first became a restaurant under the hands of Peter Chandler, the first English apprentice of the famous Roux brothers. It was reopened in 2010 and was awarded a Michelin star in 2011 under Head Chef Phil Fanning. After overestimating the journey, we arrived at the restaurant 20 minutes before our reservation time however, this was no problem and we were quickly seated in a cosy bar area. We then had a glass of champagne whilst perusing the menu and nibbling on the complimentary olives and honeyed cashew nuts. Unfortunately, the olives had stones in which I am not much of a fan of as I find it almost impossible to spit the pips out elegantly!!! The cashew nuts, on the other hand, were delicious and hinted at the delicious meal that was yet to come. We both decided that the six course tasting menu and a nice bottle of pinot grigo was the way to go (which was priced at a very reasonable £36 per person) and were then shown to our table whilst our champagne followed us. The dining room was elegant yet stylish; full of classic style with crisp white table cloths and grey walls which complimented the traditional lead windows, however, there were also hints of modernity with the red chandeliers and artwork. The fusion of the classic and modern sums up the style of the Paris House perfectly and this style is evident in the execution of each dish. Our first course, the chef’s amuse bouche, was carrot and coriander soup which was accompanied by onion and thyme bread and soda bread for the table. The texture of the soup was lovely, more of a robust foam with very small chunks of soft carrot, perfect for a first course and unlike most soups, not too filling and not too hot. Each element of the dish had a distinct flavour and complimented each other beautifully – the carrots had almost an orange like taste to them whilst the coriander seeds were distinguishable but not overpowering. The soup was wonderfully creamy, perfectly balanced by the earthy soda bread. 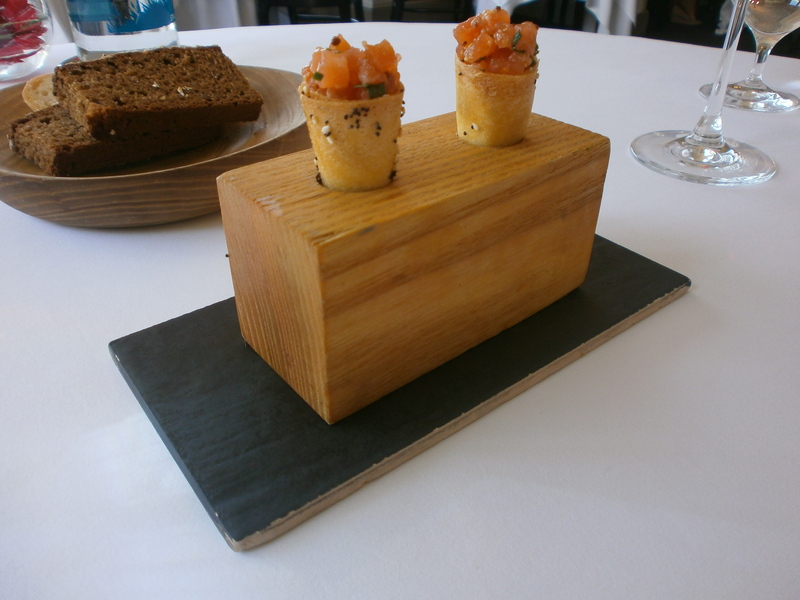 We were then surprised by a complimentary second course, another amuse bouche from the chef – smoked salmon cones. I loved the presentation of this taster and the fact that both cones came out in their own block. The cones were made out of filo pastry and contained smoked salmon, cream cheese and herbs. Both Neil and I really enjoy smoked salmon so this dish and its bold lemon and herb flavours was a welcome addition. The only thing I would say was that it was difficult to eat the cones neatly – they were a little bit too big for one mouthful but fell apart a little too much for the second mouthful! 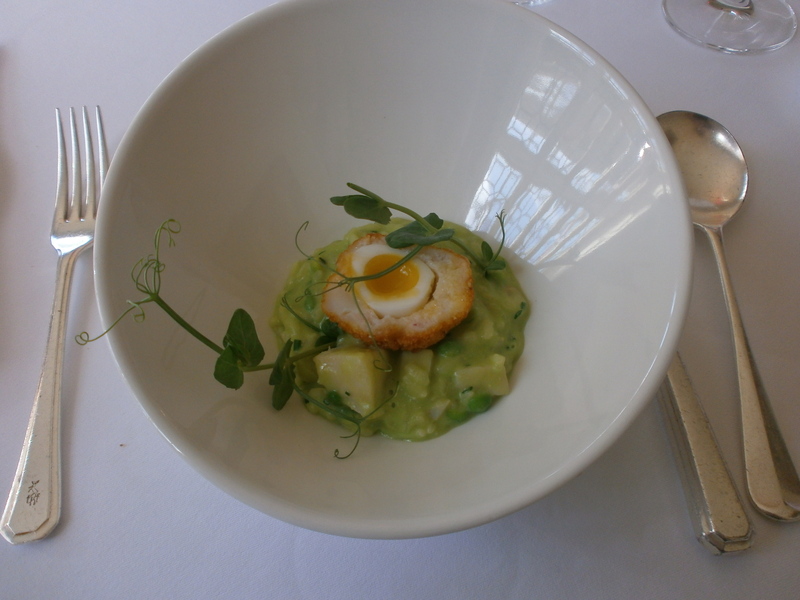 The third course was described as ‘smoked haddock, scotched egg and pea risotto’. It was beautiful to look at and I loved the shape of the bowl it was presented in. The ‘scotched egg’ was actually a scotched quails egg incased in haddock with a crunchy outer layer. The egg was cooked to perfection with an inviting oozy centre and the crisp finish created a lovely contrast; it really was a wonderful twist on the ‘classic’ scotched egg. The risotto was wonderfully soft, perfectly seasoned and also contained small pieces of smoked haddock. My boyfriend has said that this was his favourite dish of the day and it is certainly one I would be interested in recreating. 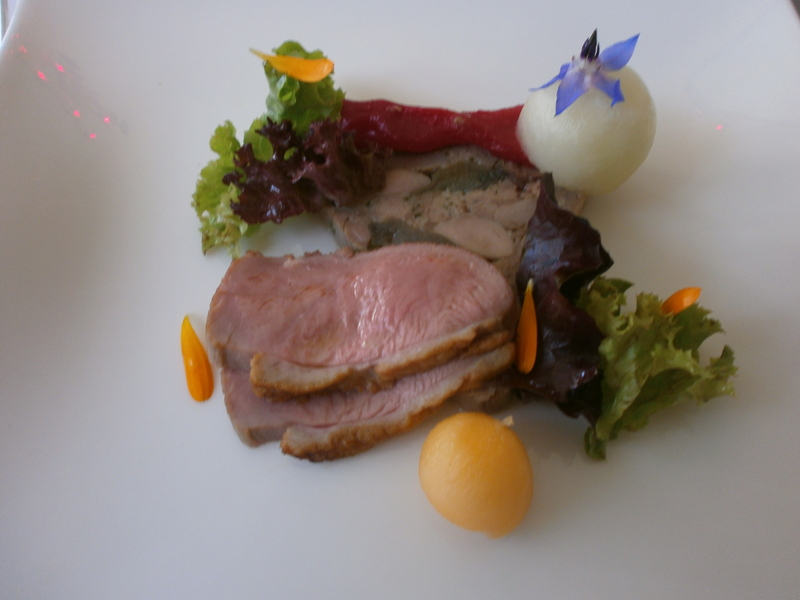 The next course was duck terrine, smoked breast and melon salad. 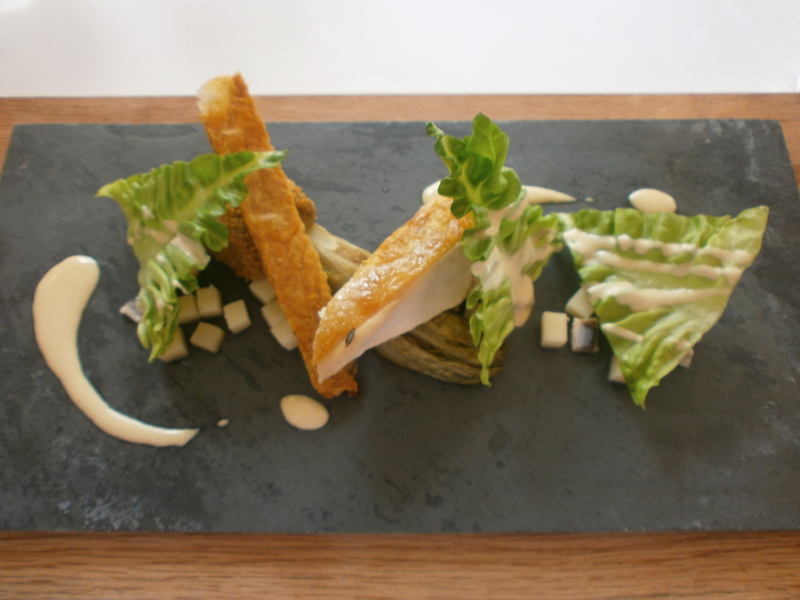 It was a beautiful looking terrine adorned with flowers and leaves which were from the kitchen garden. The duck was perfectly cooked and although quite rare, not at all chewy. For my boyfriend’s main course he chose the chicken caesar salad. You may ask why something as common as a caesar salad was on the menu at a Michelin starred restaurant however, this was no normal salad! It was beautifully presented and Mr MAC said that the chicken was so soft it practically melted in your mouth. What looked like a crouton was actually deep-fried chicken skin which although rather naughty was really tasty. I must admit, I think it is the first time I have seen my other half enjoy a salad quite so much! 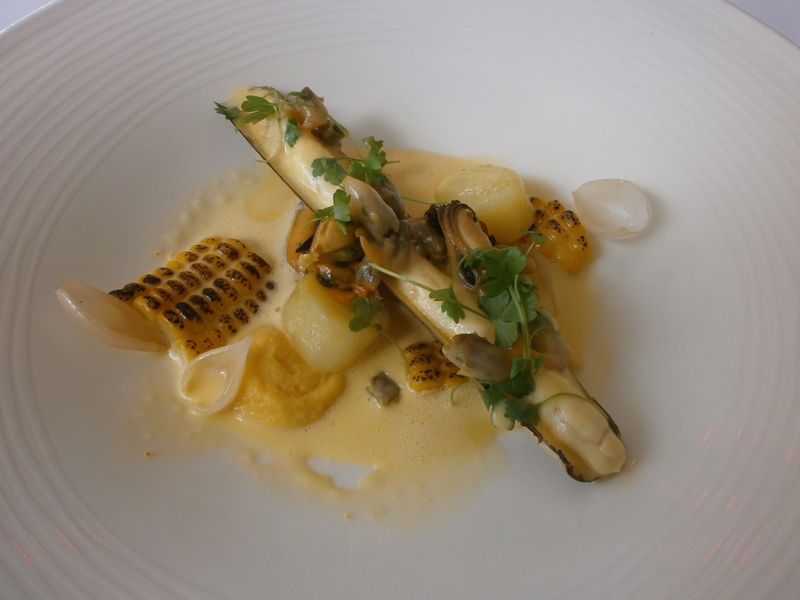 My main course was a seafood chowder with scallop and razor claim mousse, cockles, mussels and caramelised sweetcorn. The seafood elements of the dish were already in the bowl when it came to the table and the ‘chowder’ was poured over the top. The seafood was very fresh and very tasty, I loved the scallop and razor clam mousse. The sweetcorn was an unusual twist and gave the dish a bit of crunch. The chowder was very rich and creamy – the dish was just the right size. In my opinion, one of the many fantastic things about our meal at the Paris House was that we had not one but two desserts! 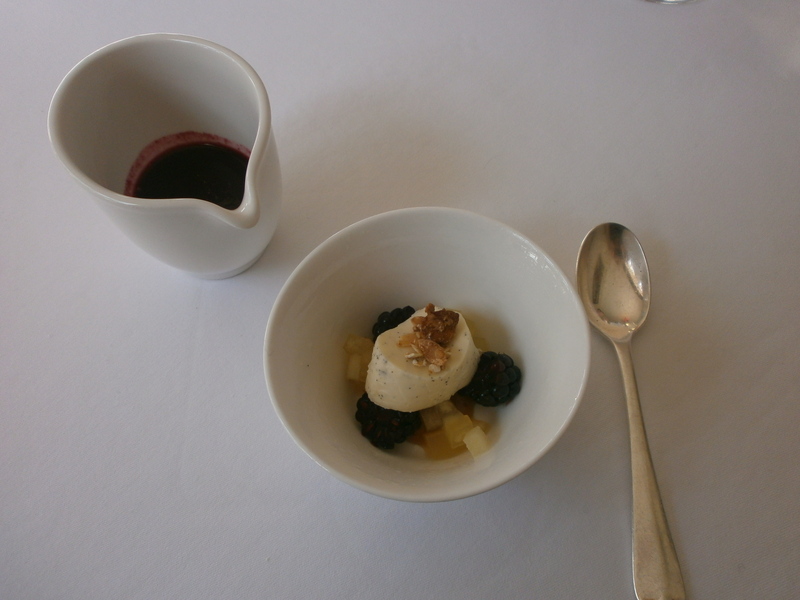 The chef’s pre-dessert contained caramelised apples, blackberries, a small vanilla panna cotta topped with oats and a blackcurrant sauce. All the flavours worked really well together and I loved the change in textures with the crunchy oats. The blackcurrant sauce was nice and sweet and brought back memories of childhood drinking ribena! The last course of the meal was now upon us and was most definitely worth the wait! 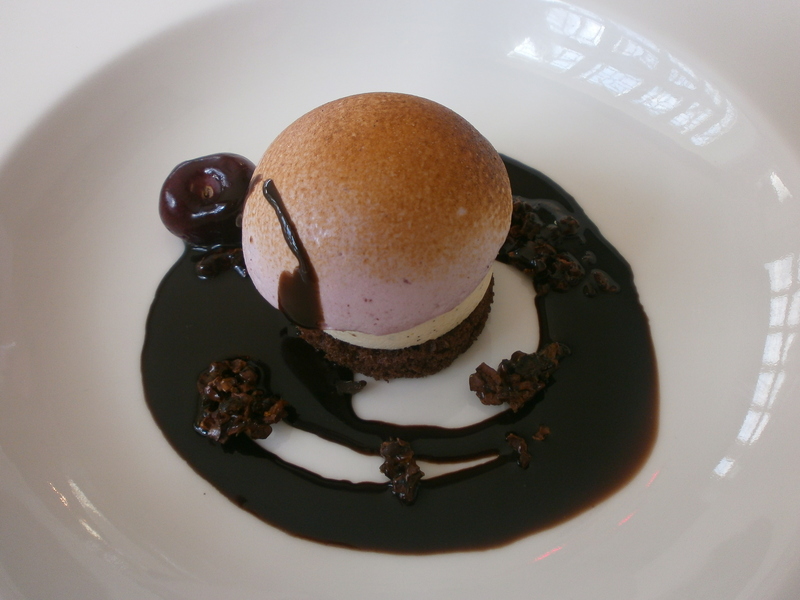 The final dish was iced vanilla parfait with black cherry, marshmallow and chocolate sauce. The marshmallow had a really fruity flavour which went well with the richer, silky chocolate sauce. Next to the parfait was a cherry filled with jam and the parfait mixture; I loved the way even this small element of the dish was so well thought out. I love a bit of chocolate so this course was definitely a bit hit with me! After a short break, the tea selection was brought over for us to look at. I must admit, I have never been informed of the selection of tea on offer in quite the same way before! 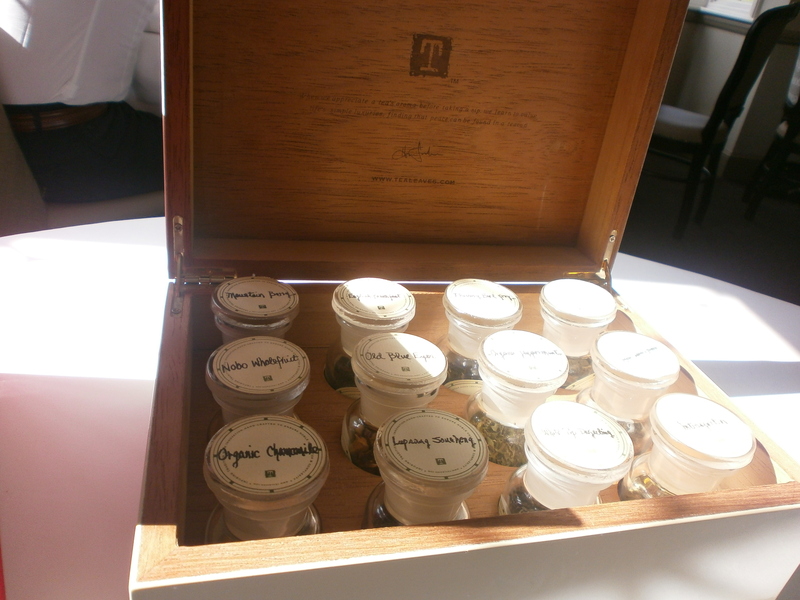 We were presented with a large box containing small canisters with all the different blends of tea in that we could sniff and chose whatever was to our liking. Whilst Mr MAC declined a tea or coffee, I opted for a double espresso. It was a lovely cup of coffee and even better, we had petit fours for both of us! First was a lovely piece of creamy vanilla fudge followed by a strawberry and mint sponge which was very moist and flavourful followed by a tangy fruit jelly. A lovely end to a scrumptious meal! The service at The Paris House cannot be faulted. Our waiter was very attentive, never letting our water or wine glasses get empty and carefully explaining each dish to us in great detail. Although some restaurants of this calibre can, I’m told, be pompus and elitist, we were not made to feel at all uncomfortable. The level of service we received made our meal even more enjoyable and a more memorable experience. I can thoroughly recommend a meal at The Paris House. Not only is the food wonderful, the setting is beautiful and the service excellent which adds to a thoroughly enjoyable experience. Yes, a meal here is not a cheap option but it is certainly one you will not forget in a hurry! I’m already looking into booking myself on to a cookery course or for a meal at the chef’s table….dining at The Paris House is truly addictive!